Want to make the most of learning centers but not sure how? Let this outstanding resource be your guide. It features four complete language arts learning center units, based on popular children's books, that will fit into virtually any curriculum. The units include Dr. Seuss and His Friends, Bears, Dogs, and American Tall Tales and Legends, and can be used in any order. Each unit comes with an illustrated bulletin board activity, a letter to parents explaining the learning center activities and suggesting home enrichment ideas, a group activity for the entire class, and "take off" suggestions that serve as springboards for extended activities across other content areas. This unique handbook provides over 100 reproducible whole language activities that will improve students' skills in listening, speaking, reading, writing, spelling, math, and art. Children will get a variety of opportunities for acquiring new knowledge, as well as practicing previously learned concepts. Primary teachers and resource-room and special education teachers will find detailed directions for using a learning center system-from introducing, setting up, managing, and evaluating learning centers as part of the regular classroom program. Carol A. Poppe received her B.A. degree from Ohio University and has taken several graduate courses at Oakland University and Siena Heights College. Mrs. Poppe has 25 years of teaching experience at the first- and second-grade levels. She and her husband, Michael, enjoy camping and have traveled to most of the states and Canadian provinces. She has three daughters, Nancy, Molly, and Jenny, who live in Michigan, Ohio, and Tennessee, respectively. Nancy A. Van Matre, who received her B.A. degree and M.A. degree in Reading from Eastern Michigan University, has been actively teaching grades 1 through 3 since 1975. She resides in Ann Arbor with her husband, Bruce Miller, and their two sons, Nick and Jason. During the past fifteen years, the authors have used their learning centers as an integral part of their classroom schedules at Clinton (Michigan) Community School. After presenting workshops, they realized that other educators wanted to begin a learning center system, but needed management techniques, leaning center activity ideas, and shortcuts. 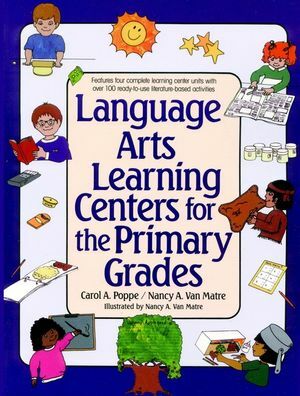 In an effort to help other educators, the authors have also written Science Learning Centers for the Primary Grades (1985), K-3 Science Activities Kit (1988), and Social Studies Learning Centers for the Primary Grades (1989), each published by The Center for Applied Research in Education. How to Manage a Learning Center System. Advantages of Using Learning Centers. How to Make a Color Wheel Featuring Four Reading Groups. How to Set Up the Classroom into Four Areas. How to Make a Desk Divider. How to Keep Track of Each Child at Learning Centers. How to Evaluate the Learning Center Activities. How to Introduce a New Set of Learning Centers to the Entire Class. How to Explain Learning Centers to Parents. Dr. Seuss and His Friends. American Tall Tales and Legends. Reinforcement of Skills at Home. Reinforement Activities for the Home.